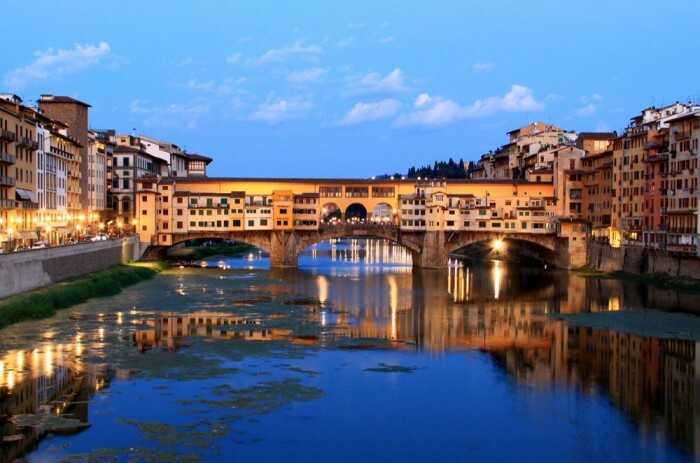 The Ponte Vecchio or ‘Old Bridge’, that joins the centre of city with the district of Oltrarno on the south bank of the river Arno, is surely one of the great icons of Florence and one of the most famous bridges in the world. It crosses the river at its narrowest point within the city, and a series of bridges – of which this the fifth – have stood on or around this spot since the days of the Ancient Romans. The current bridge was finished by 1350, built after a catastrophic flood in 1333 carried away its predecessor. It is best known today for the wooden-shuttered goldsmiths’ shops that line both sides of it, and for the Vasari Corridor that runs over it (a private aerial walkway built in 1561 so the Medici family could move between the Palazzo Pitti and the Palazzo Vecchio, safe from risk of assassination in the streets below). 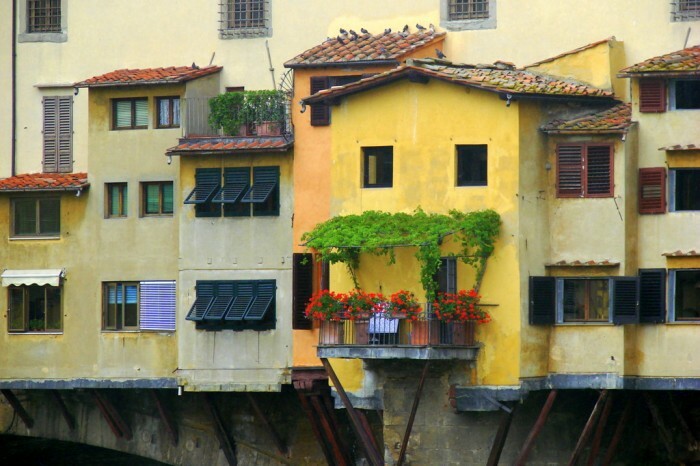 Much has been written about the Ponte Vecchio, but there are certain things about this famous landmark that you may not know. In the 16th Century, the first art historian, Giorgio Vasari (responsible for the corridor above the bridge), credited the design of the bridge to the Florentine artist and architect Taddeo Gaddi, a student of Giotto. But there is no other evidence to corroborate this, and Vasari wasn’t always right. Another name that has been suggested is that of Neri di Fioravanti, but again without supporting evidence, and modern scholars have begun to look in a different direction. Further downstream, the Ponte alla Carraia also collapsed in the flood of 1333, and Fra Giovanni da Campi, a Dominican friar of Santa Maria Novella, was the architect responsible for rebuilding it between 1334 and 1337. The Dominicans of Santa Maria Novella were experts in building large vaults, and the first to consistently use the term ‘architect’ (as opposed to master mason) in their documents. 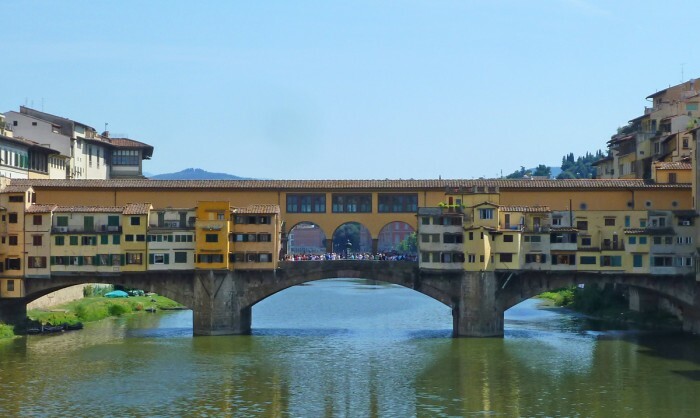 The audacious use of wide, flattened arches for the Ponte Vecchio – like those of the Ponte alla Carraia – strongly suggests the involvement of Giovanni da Campi or another Dominican. Da Campi could not have seen the construction through to completion, as he died just three months after the project was commenced in May 1339, but it could have been built to his design. The involvement of the Dominicans becomes more likely when considering the horizontal proportions used in the plan of the bridge and the blocks of shops built upon it, which can be reduced to 1:2:4, and correspond to the first progression of Platonic numeric theory. The bridge was commissioned to be “beautiful and honourable”, and in the Middle Ages harmony was regarded as an indispensable part of beauty. The Ponte Vecchio was designed in part as a defensive structure. 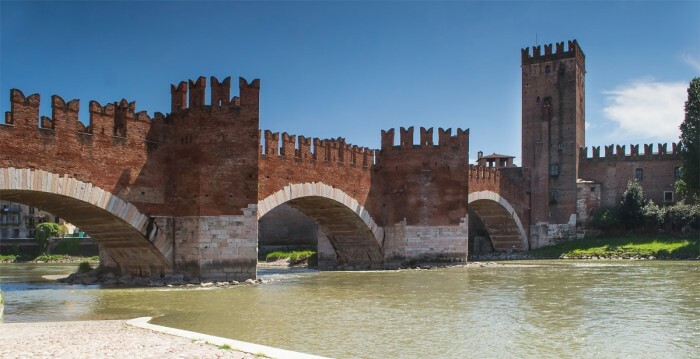 In Medieval Italy the use of rivers to launch attacks was a well-established element of the art of war, and although Florence was surrounded by walls, an enemy might attack in boats along the Arno itself. Following the practice of the previous bridge here, the Ponte Vecchio had four towers (two at each end), and walls with battlements running down both sides, broken only by the observation area in the very centre of the bridge. The Mannelli tower (now much reduced) at the south end is the only obvious survivor of these fortifications, which can be seen in the famous 15th Century ‘Chain View’ of Florence. A document of 1346 lists regulations that include fines for shopkeepers breaking the exterior walls facing the river. Florence’s other three Medieval bridges, being of less strategic importance, were not fortified. To recoup the money spent on building the bridge, soon after its completion, the government of Florence rented out the 46 shops built on it. Shops had been built on the previous bridge, but being of wood, they tended to catch fire, so this time they were built of stone. Various tradesmen used the shops to start with, but in 1442 the government let them all to the Guild of Butchers. At first, strict control by the ‘Captains of the Bridge’ maintained order in this meat market, but in 1495 the government made the grave error of selling off the shops to raise cash, and freed from oversight, the traders soon began to turn the bridge into a squalid place. Shopkeepers began to alter the superstructure too: by the 16th century the old battlements had gone, windows had appeared, and they started to build upwards and backwards out over the river, supporting the new rooms on wooden props called sporti. 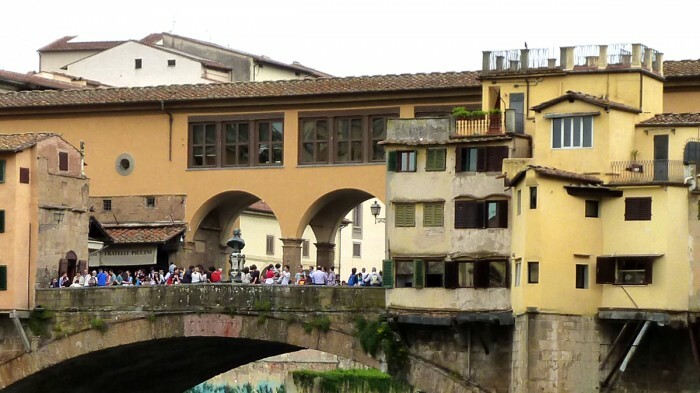 By the 17th century the bridge had taken on the appearance we see now, but the rather quaint chaos of the shops today is hardly the rational order that the government of Florence had in mind when the bridge was first commissioned! The gallery on the west side of the Vasari Corridor was installed for the benefit of Adolf Hitler. The addition of the Vasari Corridor also changed the character of bridge considerably, and while the Medici who used it were more concerned about the stench from the meat market below than the view out of the windows, nearly 400 years later Benito Mussolini wanted his guest of honour – Adolf Hitler – to enjoy a good view of Florence from the corridor during his State Visit on the May 9, 1938. Accordingly, Mussolini had the original three windows in the centre of the bridge on the west side knocked into one large viewing gallery for the benefit of Führer and his party. It may be just as well he did, because when the retreating German forces blew up all the other bridges in 1944 to slow down the advancing Allies, they left the Ponte Vecchio intact, instead reducing the buildings at both ends of the bridge to rubble, in order to block the streets. The bridge might have been spared by the Germans in 1944, but when a catastrophic flood hit the city in November 1966, there were real fears the bridge would collapse. It was repeatedly struck by large debris carried by the raging waters of the Arno and whole tree-trunks pierced right through the shops on the upstream side. The Vasari Corridor is also an art gallery, and a brave group of museum staff, given just a few minutes by the fire brigade, entered the section of corridor over the bridge to save the paintings hung there. They formed a human chain to get them to safety. Later, one of them recounted how the pressure of the water on the bridge set up vibrations that made the whole structure actually hum like a musical instrument. It must have been terrifying, but the paintings were saved, nobody was hurt, and in the end the bridge survived. 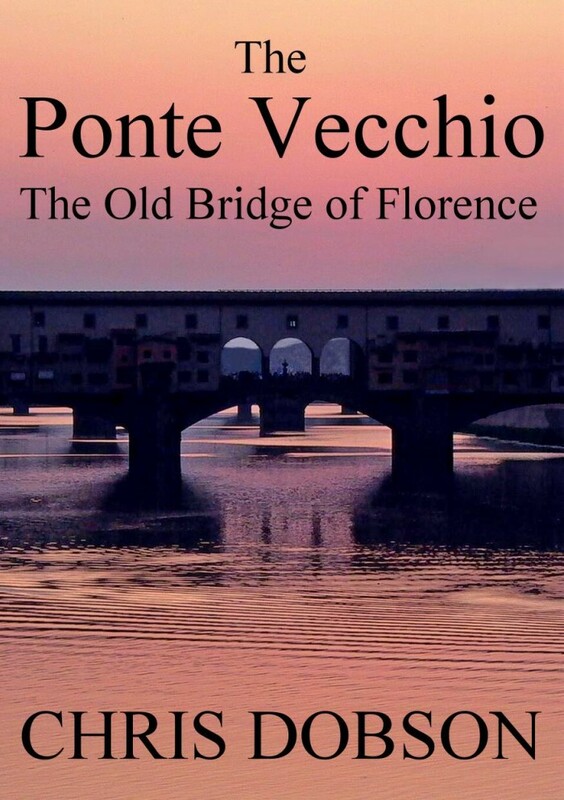 You can read more about the Ponte Vecchio and its predecessors in Chris Dobson’s book: The Ponte Vecchio, The Old Bridge of Florence.